Missing teeth can impact your mental and physical health. Dental implants can improve your appearance and your smile while also boosting your confidence, self-esteem and desire to attend social outings. Since dental implants are permanently fixed in the mouth, there is no need to worry about expensive adhesives or removing the teeth at night. They can be brushed and flossed just like your other teeth so there is no extra cost involved with keeping them clean. Unlike dentures, there are no dietary restrictions with dental implants. You can consume chewy or sticky foods without difficulty. In addition, the ability to chew harder foods like apples contributes to your overall health and is achievable with implants. Dentures can slip when smiling, laughing, kissing, yawning, coughing, eating or talking. When dentures slip, it can be embarrassing because you may have to reposition them. In addition, pronouncing everyday words can be troublesome and can result in a slur or mumble. However, dental implants do not slip and function like natural teeth which allows you to do all the above actions with ease. Eating can be a big problem with dentures. Food gets trapped under them and can cause pain as you chew. Therefore, you will need to remove the dentures in order to get rid of the trapped food. Continuous food entrapment can lead to blisters on the gums, infections and gum disease. 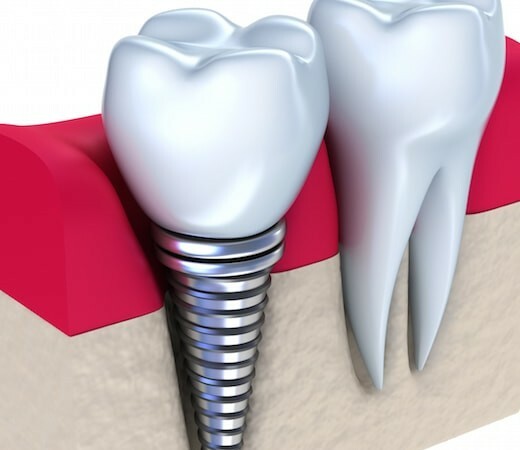 With implants, you can bite naturally and eat without any discomfort. Missing teeth can cause additional health issues such as the deterioration of your oral structures as well as making the face prematurely sag or appear sunken. Dental implants help retain the natural contour of your face by protecting the jawbone and other oral structures. 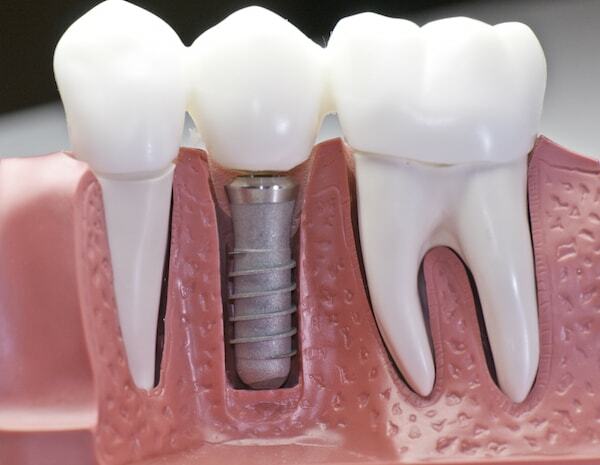 Implants stimulate the natural bone while providing growth and limiting bone loss. Dental implants last much longer than traditional tooth-supported dental bridges. Bridges generally last between 5-7 years but usually no more than 10 years. On the other hand, implants can last a lifetime. Dental bridges require some destruction of the neighboring teeth in order to attach and support the bridge. 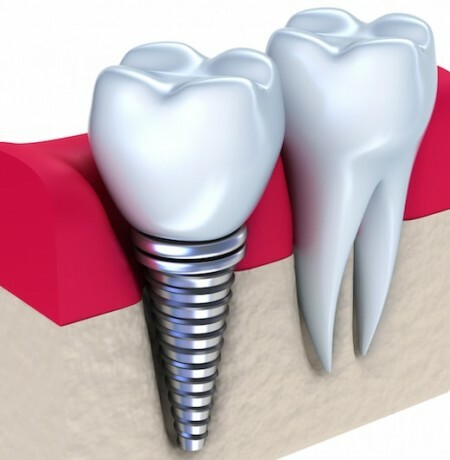 Since dental implants are positioned within the jawbone of the missing tooth, the surrounding teeth are not impacted. 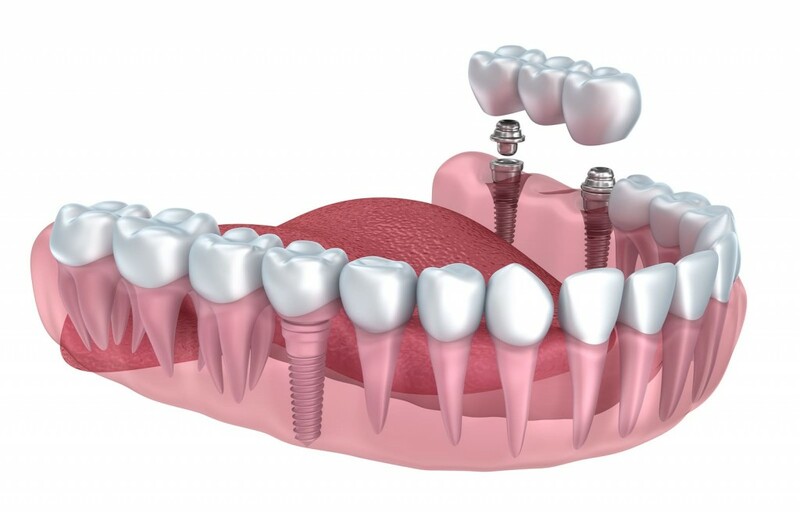 In addition, dental implants prevent the healthy teeth from shifting due to the neighboring space being unoccupied.